Someone just gave me a big donation to go on the commissary accounts of marijuana prisoners. The second annual Chalice festival has come and gone and just like the first time around everyone had an incredible time. Unique among marijuana expos, Chalice especially pays homage to two important aspects of cannabis culture: hash and glass. Likewise you’ll always find an astounding array of marijuana concentrates — hash oil, shatter, wax et al and the talented extraction artists who make them. 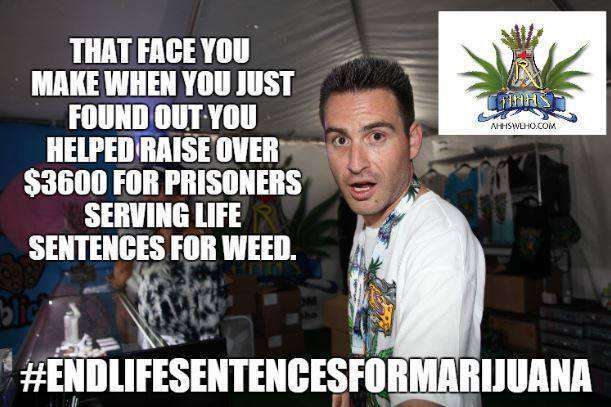 But for me, the highlight was the Marijuana Prisoner Outreach that was happening in and around the AHHS West Hollywood tent where I teamed up with some of my favorite people, Stephanie Landa, Dina Browner (AKA Dr. Dina), and Jason Beck to raise commissary funds for marijuana prisoners and gather clemency support letters for prisoners serving Life Sentences for Marijuana. More than anyone else, Stephanie Landa is personally responsible for my getting involved with prison outreach as she brought the marijuana prisoners to my attention soon after I first got involved in the cannabis movement. She hasn’t let up since, something for which I am forever grateful to her. 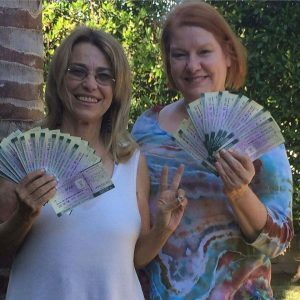 Stephanie had been raising funds for pot prisoners’ commissary for years – ever since she finished her own 4-year stint in federal prison for growing medical marijuana. A battle with cancer slowed her down for a year or so, but Stephanie is back, cancer free, and fighting harder than ever for marijuana POWs. Stephanie and Dina had already been long time friends. Dina, having been through police raids herself and having loved ones in prison, was also passionate about the cause. So was her partner Jason Beck of AHHS West Hollywood, LA’s oldest medical marijuana dispensary. Both DIna and Jason had always been supportive of all my past prison outreach efforts. So Browner and Beck came up with some creative ways that AHHS could help the prisoners while everyone was having fun at Chalice. They talked to Stephanie and I about teaming up on the project, something we were thrilled to do! 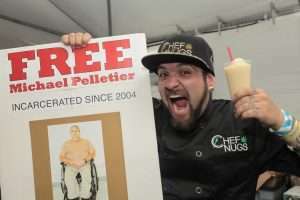 Chef Nugs enjoys a Slushie, benfitting marijuana prisoners. The first idea was slushies – the perfect icy cold refreshment to counteract the blazing California Inland Empire heat. Plenty of Chalice attendees were looking for a cold drink without alcohol or cannabis and we provided them in 4 flavors. Best of all 100% of the money collected from slushie sales went on the commissary accounts of pot prisoners. Inmates have to buy nearly everything they need and the money collected will help them buy necessities like food and toiletries, and be able to afford to call or email their families and loved ones. Lots of people came up to pay for their $3.00 slushie with a 5, 10, or 20 dollar bill and said, “Keep the Change,” knowing it was going directly to help marijuana prisoners. Other generous donors came up and handed us large bills. 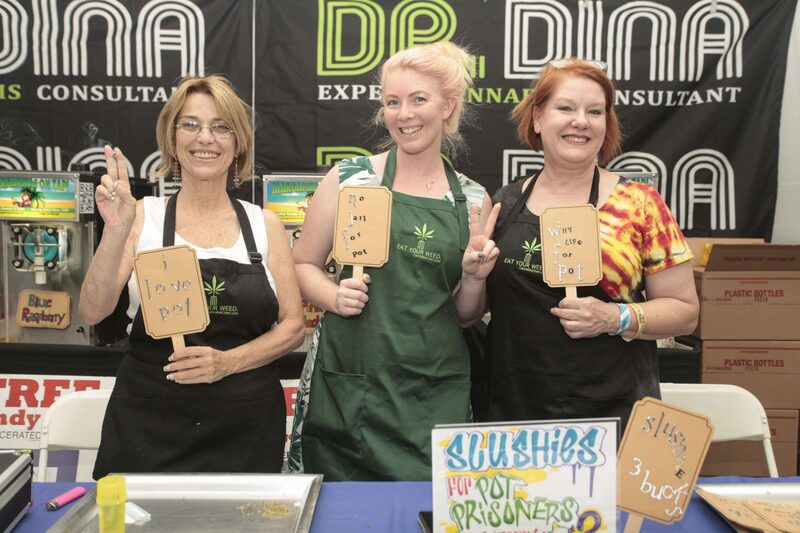 For activists like Stephanie Landa and myself, who have worked long and hard for the POWs, it was the most rewarding and heart warming thing in the world to witness the cannabis community coming together for them. Dina Browner AKA Dr. Dina, at the #hotboxcopcar at Chalice, benefitting marijuana prisoners. Funds for POWs also came via what has affectionately come to be known as the #hotboxcopcar. 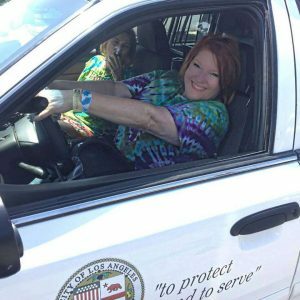 Jason and Dina rented an actual LAPD cruiser, complete with a uniformed “LAPD officer” (OK the car is a movie studio rental and the officer, an actor, is a former cop who now does prop rentals, consulting and casting for the film and TV industry, but it all looked 100% real). 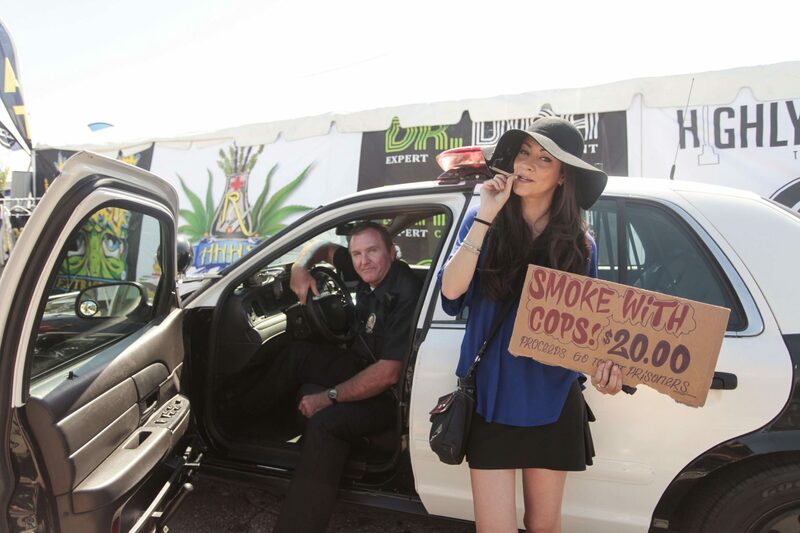 For a fee Chalice attendees could “Hot Box the Cop Car” – smoke in it, dab in it, front or back seat, with or without the uniformed officer, without or without handcuffs. It was the ultimate photo/video op. People had tons of fun with the Hot Box Cop Car and I am sure lots of folks who couldn’t attend Chalice got freaked out when photos and videos of their friends smoking and dabbing with a uniformed cop in an LAPD police car started surfacing on social media. Jason Beck of AHHS West Hollywood sponsored the marijuana prisoners fundraising efforts at Chalice. The juxtaposition between the fun and seriousness of what it was supporting was not lost. 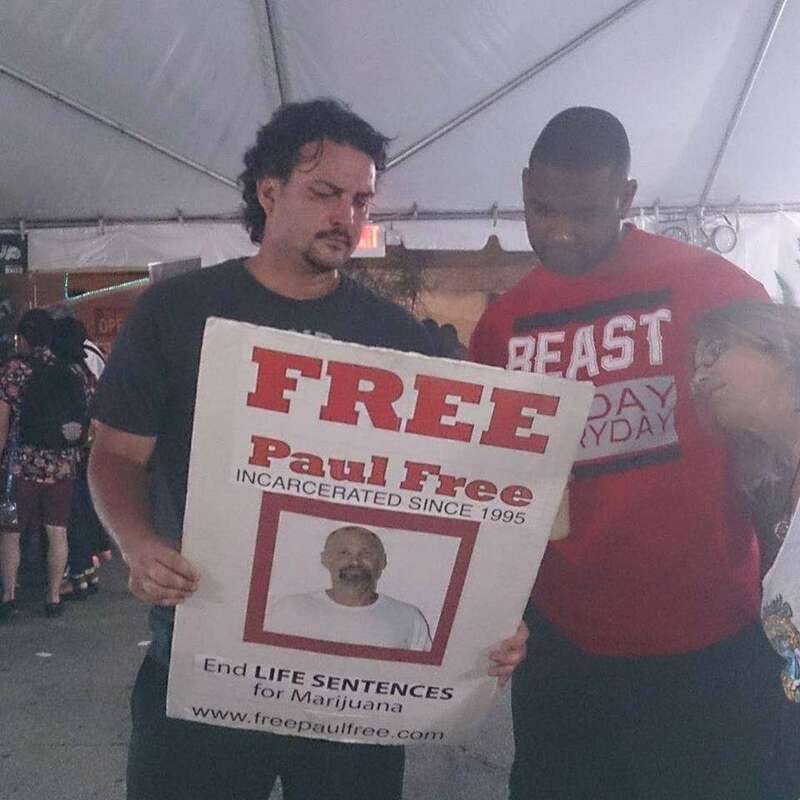 The FREE POT LIFERS posters I created were on prominent display so everyone could learn the truth: we have many prisoners in the United States serving Life Sentences for nonviolent, victimless, marijuana conspiracy offenses. I talked to more people than I can count who had no idea the lifers even existed, let alone the fact that is even possible for a nonviolent, first-time drug offender to end up with a prison sentence of life without possibility of parole. As always, when the pubic learns about this, they are outraged. Likewise we had no trouble collecting hundreds of signed clemency support letters for marijuana lifers John Knock, Billy Dekle, and Antonio Bascaro. Marijuana Prisoners: Each POWs story is on the back of his Life for Pot poster. When it was all over and dust had cleared, we were able to put between $135.00 to $150.00 on the commissary accounts of each of 27 marijuana prisoners. This was in the week immediately following Chalice in order to get the money in the prisoners’ hands as soon as possible. Sending the commissary funds helped reduce the burden on the inmates’ families and had a huge impact on the POWs themselves — it would take months for most of them to earn that working for slave wages in prison. Chalice was an epic event with a great vibe. There was so much to see and do (I have not even touched on all the great musical acts they had). But for me the most important thing had nothing to do with any of that. Too often activists and advocates feel like they are banging their heads against the wall, that nobody really is listening and nobody really cares. I now know that is not true. I now see that the Cannabis Community really does want to support out POWs, those paying the ultimate price in the drug war. And that does my heart good and makes me want to fight even harder for them. I can’t thank Dina Browner, Jason Beck, and Stephanie Landa enough for the experience. The marijuana prisoners I work with can’t thank them enough for the money, but perhaps more importantly for the hope, something that can be in short supply to those warehoused away behind bars. People who reach in to those locked away are rare. 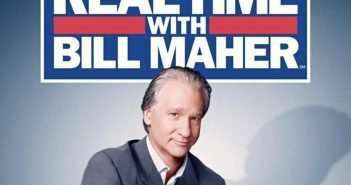 I heard from more than one inmate who said that other inmates in their prisons – people who were not pot prisoners and did not directly benefit from our actions – had their spirits lifted and hope renewed by the sheer virtue of the fact that people in the cannabis community were coming together to help prisoners.